By using its proprietary execution of heat-assisted magnetic recording (HAMR) technology, Seagate has developed the first 16TB enterprise hard drive to allow businesses to store more data than ever before on 3.5-inch drive. The company's new drive has the highest capacity ever produced and it is on track to grow beyond 20TB by 2020. 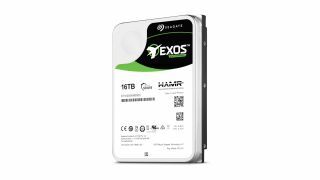 Seagate used the 16TB pre-release version of its HAMR-based Exos hard drive to run tests to see how well it would perform in enterprise environments. The tests were successful and confirmed that HAMR drives are plug-and-play which will allow companies to increase their storage without having to make changes to the architecture of their data centers or systems. HAMR utilizes a new kind of media magnetic technology on each disk that allows data bits to become smaller and more densely packed than ever before while still remaining magnetically stable. A small laser diode attached to each recording head heats a tiny spot on the disk and this allows the recording head to flip the magnetic polarity of each very stable bit to write data. The company first tested its HAMR technology last year in a demo in which the drives read/write heads exceeded industry standards for reliability and lifetime data transfer capability. Now that Seagate has completed its product-level HAMR tests, we will likely see the technology in new commercial drives for the enterprise very soon.